WALL STREET JOURNAL -- "Americans got richer for a third straight quarter at the end of 2009, a favorable trend for an economic recovery that could use some more fuel. A quarterly Federal Reserve report Thursday said U.S. households' total net worth climbed 1.3% in the fourth quarter, to $54.18 trillion from the third quarter's $53.49 trillion. 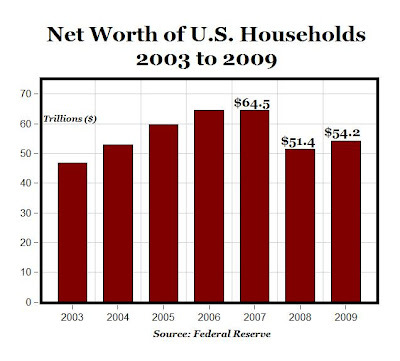 For 2009 as a whole, net worth rose 5.4%. Household net worth is assets, such as home equity, minus liabilities, such as mortgage debt. A large chunk of the increase in net worth came from a drop in household debt, as an increasing number of financially stretched consumers defaulted on mortgage and credit-card debts. While the defaults are painful for families and costly to banks and investors, economists say they are also speeding the financial rehabilitation necessary for a return to robust growth. "It puts us closer to the point where the consumer can start making a stronger contribution to recovery," said Joseph Carson, director of global economic research at AllianceBernstein in New York." MP: The $2.8 trillion increase in household net worth represents an increase per household of almost $25,000, and brings average net worth per household to $477,277. With Bill Gates & the super rich in the mix, average household net worth is worthless. What's happening at the median? Only 60% of working people are saving for retirement (ex FDIC) currently. 54% of workers have less then $25,000 in savings. As housing goes so goes most of net worth for the average person. Another meaningless aggregate number. Maybe we could look at the changes in average height, so we can all feel taller. It will help us offset the fact that based on our average weight, we're all fatter. Which begs the question, how does the inclusion of an indivdual's share of government debt effect personal net worth? Why Would AOL Abandon Bebo Rather Than Sell It?